Despite its many and varied attractions, a holiday at Jeffrey's Bay is ultimately all about being by the sea. What better than to walk straight out of your self catering accommodation onto the beach or sit on your private deck and enjoy the sweeping views of St Francis Bay? 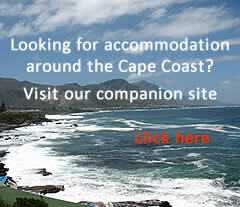 Accommodation in the Jeffrey's Bay area gives you access to miles of beach and magnificent sea views. Enjoy your choice of water sports, sunbathe or simply watch the surfers, boats, anglers and other strollers. There are numerous guest houses and self catering accommodation options from where you can explore the vibrant and exciting village of Jeffrey's Bay. Despite the growth that has taken place here, JBay has remained a village in both appearance and atmosphere.The region also encompasses the neighbouring resorts of St Francis Bay, Port St Francis, Cape St Francis and little Oyster Bay in amongst its dunes. Alternatively, take a trip inland to the small market town of Humansdorp.Jeffreys Bay is also well-situated for visiting Patensie and the fertile Gamtoos River valley with its beautiful scenery and rich citrus orchards.Port Elizabeth and its many attractions is only a 40 minute drive away while the Addo Elephant National Park is only another 20 minutes away along the N2.For a real nature experience, base yourself in Jeffreys Bay and visit the Baviaanskloof, the best kept secret of the Eastern Cape. Jeffreys Bay is the perfect starting point for a round trip with, ideally, an overnight stop along the way so as to give yourself time to enjoy the scenery to the full and return via the Langkloof. Accommodation in the Jeffrey's Bay area gives you access to miles of beach and magnificent sea views. Enjoy your choice of water sports, sunbathe or simply watch the surfers, boats, anglers and other strollers. There are numerous guest houses and self catering accommodation options from where you can explore the vibrant and exciting village of Jeffrey's Bay. Despite the growth that has taken place here, JBay has remained a village in both appearance and atmosphere. The region also encompasses the neighbouring resorts of St Francis Bay, Port St Francis, Cape St Francis and little Oyster Bay in amongst its dunes. 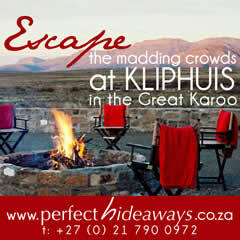 Alternatively, take a trip inland to the small market town of Humansdorp. Jeffreys Bay is also well-situated for visiting Patensie and the fertile Gamtoos River valley with its beautiful scenery and rich citrus orchards. Port Elizabeth and its many attractions is only a 40 minute drive away while the Addo Elephant National Park is only another 20 minutes away along the N2. For a real nature experience, base yourself in Jeffreys Bay and visit the Baviaanskloof, the best kept secret of the Eastern Cape. Jeffreys Bay is the perfect starting point for a round trip with, ideally, an overnight stop along the way so as to give yourself time to enjoy the scenery to the full and return via the Langkloof.